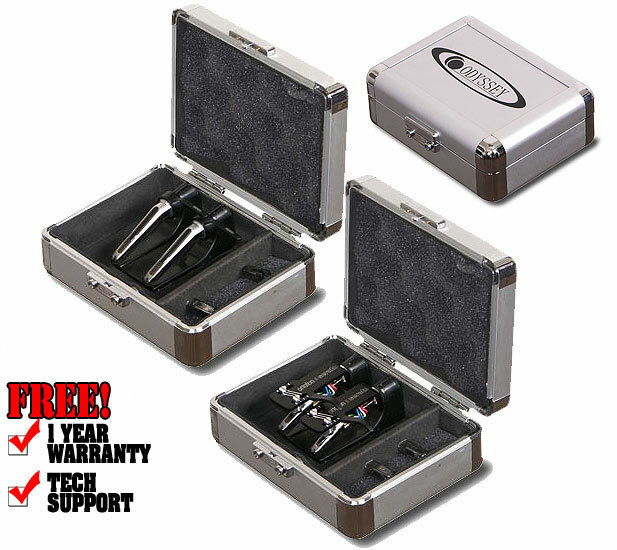 The best DJ turntable needle cartridge protectors when you're a DJ on the go, Odyssey's Krom™ KCC Pro cases protects your most valuable spinning tools with functional style. Whether you have Shures, Ortofons, Stantons, Technics etc...you'll have no worries with them suspended on the cartridge bayonet holders securely held in place and cushioned by soft density cartridge lid egg foam. Also includes a compartment for your spare needles just in "case". The chrome and silver KCC2PROSL holds one pair of turntable cartridges. Also available in all black and in a four cartridge holder case.